Hot Metal Bridge Faith Community in Pittsburgh, PA, has hosted a free, bi-weekly meal for people on the city’s South Side for almost 10 years. About 75-100 meals are served each night to a diverse group of guests that includes senior citizens and folks experiencing homelessness. 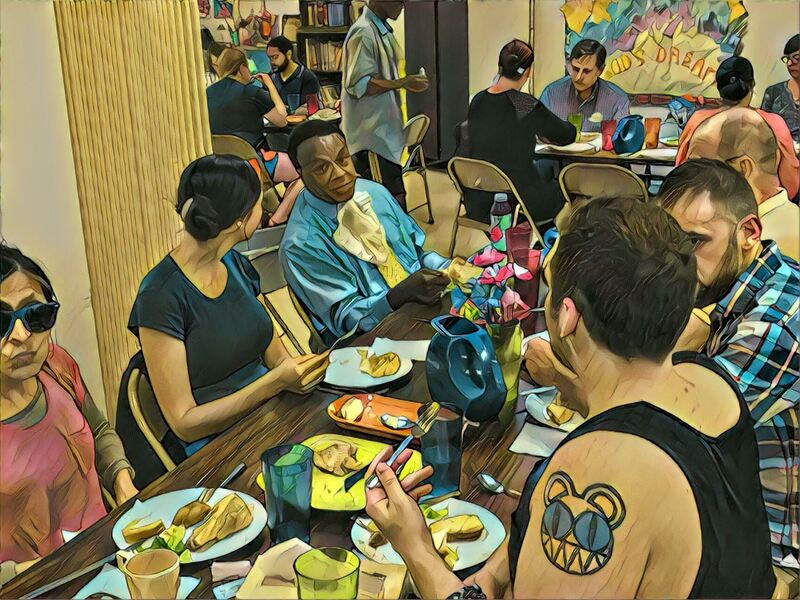 Sensing that a similar outreach was needed in the nearby Oakland neighborhood, Hotel Metal Bridge has created the monthly Oakland Community Meal. While the goal is to provide food for those in need, it also attempts to allow for conversation and fellowship to provide additional opportunities for peacemaking in a neighborhood where there is sometimes conflict and tension between students, residents and the homeless. A $5,000 Synod of the Trinity Peacemaking Grant was awarded to Hot Metal Bridge Faith Community to assist it in starting this initiative. 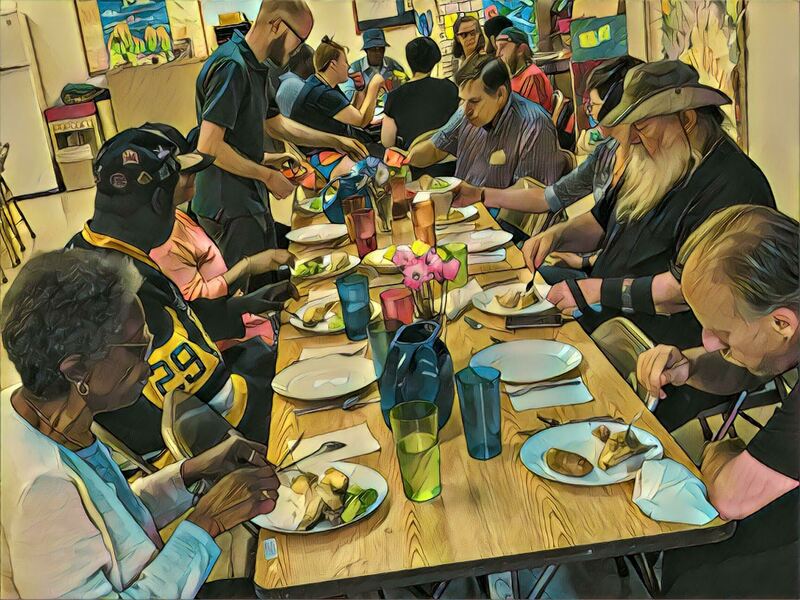 What follows is a synopsis of the Oakland Community Meal as written by the Rev. Michael Holohan, who is the organizing pastor at The Commonwealth of Oakland, which coordinates the meal. The Commonwealth of Oakland is a welcoming and affirming community of faith sponsored by Pittsburgh Presbytery and supported by the Hot Metal Bridge Faith Community. The meal is hosted by the nearby Community of Reconciliation Church. The meal has created many opportunities for partnership and collaboration. Our initial partnership was with the Hot Metal Bridge Faith Community (South Side), which sent about a half dozen leaders to join the launch team that organizes the meal and worship. 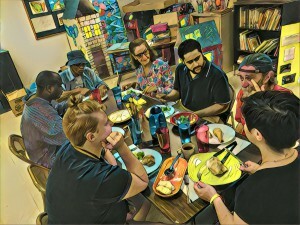 The Community of Reconciliation (a union church of four denominations) agreed to host us in their building in North Oakland, and they have gone beyond that. COR members have joined us for dinner and worship, have contributed funds and have offered encouragement. One member (a board game enthusiast) is coming to our November dinner to host tabletop games to engage our guests. In May, the adult Bible study from Grace Memorial Presbyterian Church (Hill District) came with the Rev. Gavin Walton to join us for dinner and worship. And finally, Third Presbyterian Church (Shadyside) invited us to visit their adult Sunday school class to share about our work and afterwards contributed funds to The Commonwealth. 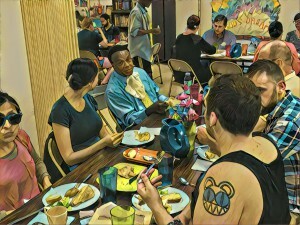 Gathering around a meal has also led to opportunities for conversation and action around issues of social righteousness. During the Poor People’s Campaign this summer, we experimented by placing printed copies of the campaign principles on the tables and encouraging folks to read and talk about them. A few people engaged, and it led to some interesting exchanges about effective tactics for social change. After the terrorist attack at Tree of Life Congregation, the leadership team coordinated with a few dinner guests to #showupforshabbat at Rodef Shalom Congregation and to participate in the Pittsburgh Loves All Our Neighbors solidarity march. This year our pastoral resident, Erin Angeli, has been talking with a few of our LGBTQIA guests about their experiences of church and family hurt. She recently launched a Queer Spirituality Group to be a supportive space for talking about the unique experiences of being an LGBTQIA person in spiritual community. Hope and healing are being offered to folks who have suffered from social prejudice. But perhaps the most significant way in which our community is experiencing social righteousness is through the unplanned conversations that happen over our meals. A diverse group of people gathers there from different socio-economic conditions, religions, sexual and gender identities, nationalities, abilities and cultural and racial groups. The boundaries between people result in violence and injustice, and crossing those boundaries is the way forward to peace. One obstacle regarding our meal is that some guests perceive the food as being intended for the homeless only. We notice these guests hovering around the edge of the room or saying things like “I don’t want to take anyone’s food.” Unfortunately, these good intentions perpetuate a hierarchy that we want to dismantle. We’ve taken some steps – in words and actions – to clearly communicate that this is a family dinner and not a soup kitchen. But it’s still a challenge for some people. We are planning to experiment by using communal art projects to draw people together. Karen Rohrer, director of the Church Planting Initiative at Pittsburgh Theological Seminary, recently led our leadership team through a sample project and we were pleasantly surprised that fresh opportunities for conversation opened up while we were engaging our minds and hands. To date, about a dozen undergraduate and graduate students have come through so far this year. But we are hoping for more visits and regular participation. So, one piece missing from our community tapestry is the university community. We are gearing up now for a bigger outreach in January when students return from holiday vacation. Looking forward, we are planning a year-end celebration event where we will articulate our vision, share some stories and images from the year, and invite people to participate and support. We will invite folks from our church partners and the neighborhood organizations we have relationships with, as well as guests and leaders from The Commonwealth. We had an opportunity to share briefly about our work at the Pittsburgh Presbytery meeting in September.